My annual Holiday Sales Thread will begin tonight at 7 PM CST. I'll be listing books over the next three weeks, hopefully ending on New Years Day. Invoices will be sent in early January. No payments are due until that time, and no shipping will occur until that time. So even if you don't have enough cash right now, you have about 3 weeks to save up for your purchases. Its been a great year in the comic business. Between the website and conventions, I have bought thousands of books this year. I've been setting stuff aside all year long for this sale. Many of those books will be offered here for the first time anywhere. There are keys, semi-keys, movie books, high grades, mid grades, and low grades, and as always, lots of books that you just don't see around, and almost all of it will be CHEAP, heavily discounted in some cases! Lots and lots of bargains for the collector, and room for dealers to make money. 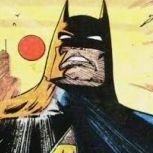 Lots of Neal Adams, Bernie Wrightson, Jim Steranko! Frazetta covers, Raboy covers, Schomburg covers, LB Cole covers, GGA, Pre-code horror, Pre Hero Atlas, and cool Romance books that you just don't see. I can't imagine that you won't be able to find something you are looking for at a very good price. Typical board rules apply. is king! I welcome reasonable offers by PM, but not 30 seconds after the book has been posted. And no editing of I'll Take its. If you click it, its yours. Also, no trading. I can't keep up with that stuff. If you buy something by PM, you still must post the I'll Take It in the thread. Please keep the chatter to a minimum. Payment - Paypal is the preferred method of payment, but I will accept checks or money orders. I also do time payments on purchases (combined or individual) of more than $500.00. You must check with me prior to purchasing for time payments. I prefer NOT to draw payments out more than a month, and if you do time payments with me, you can't be buying other stuff on the boards, while I am waiting for your payment. And typically speaking, I don't do discounts and time payments together. I offer full 100% money back guarantee, whether in the thread or on the website. Buyer pays return shipping. Item must be returned within 10 days of receipt. Shipping - I will ship worldwide. I use Fed Ex on large shipments and USPS Priority for everything else. USA Priority shipping begins at $8.00, and goes up from there. I do not use first class shipping for international. Priority mail is the only option, unless you clear it with me first. I will be listing on 5 or 6 days over the next 3 weeks. Stay tuned for the schedule. All of the stuff in the picture below will be listed in the thread, plus plenty of surprises along the way, Also, lots of fun stuff like treasuries, memorabilia, hard covers, some horror mags, and who knows what else. If you have questions or requests, please PM them to me. Thanks for looking and get ready to grab some books! Recap of what is left! Just click the page link and it will take you right there. How about a few markdowns! Please quote the book and the discount. Thor #182 VF- $20 Thor vs Doom! Thun'da portfolio very nice $50 Frazetta, large, will cost more in shipping. Here is one book for now, in order to stay in compliance with board rules! 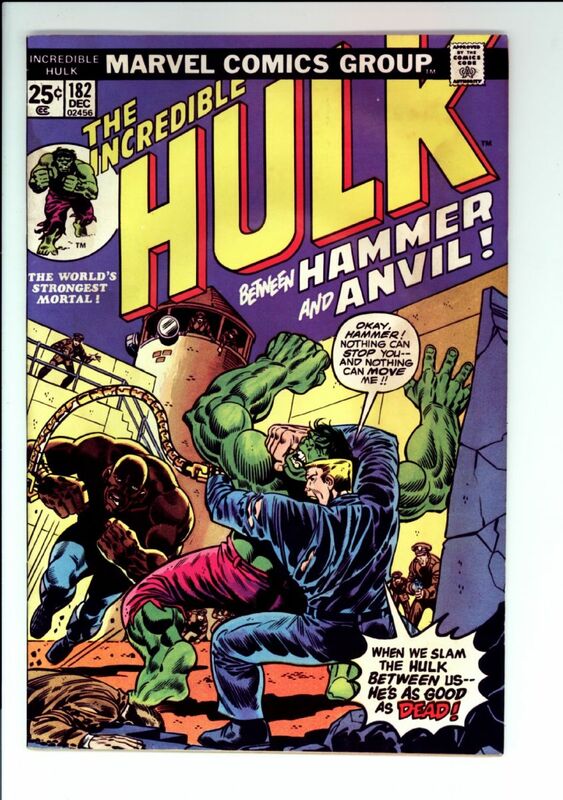 Hulk #182 VG $40 SOLD! Most fun sales thread of the year. Especially when the chumming begins. Holy cow! I'm newish to this place. Half of my wish list for 2019 is in those pictures. I spy with my badgery eye many an item what warms me furry bits! I've bought stuff in this sales thread the last couple of years and couldn't be happier. Great stuff here and I look forward to another round of great books at great prices. Very cool I always look forward to this thread. In alphabet or random order? This will be an amazing sale thread. This is going to be a lovely thread. I see an Emergency! #1 in there. Will this be like last year when Dale personally delivered the comics on Christmas Eve, in a Santa suit, down the chimney at 3am? I need to know whether to leave milk and cookies. I like Pillsbury freshly made chocolate chip cookies, and Lactaid milk (preferably not warm). Heat the cookies and chill the milk. Got it. Glad I was able to get one book in this typically feeding frenzy of a thread. Dale - I think you used last year's template and they are requiring a return policy be listed this year.